Elastic Beanstalk is a orchestration service which uses platform-as-a-service model to integrate multiple AWS services for application deployment and management. The services that beanstalk integrates are EC2, S3, ELB with Auto-scaling,Cloudwatch . Elastic Beanstalk supports Ruby, php , Python, .NET, Java, Node.js applications and Webservers such as Apache, IIS. We have options to deploy project via Zip, WAR file, Docker and Git. 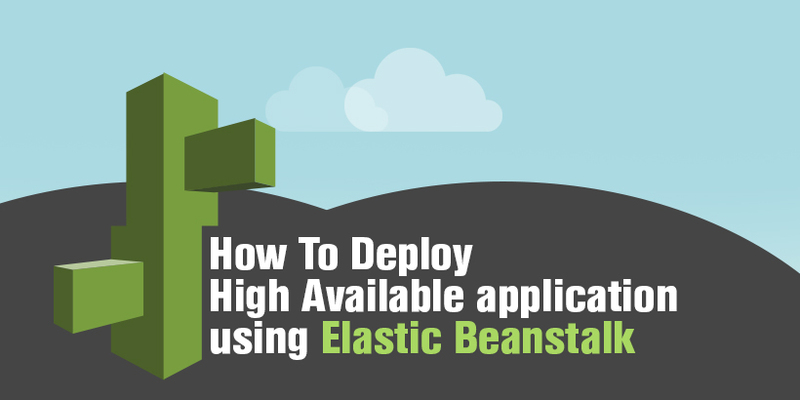 How to deploy HA application using Beanstalk application? Step III) Follow the steps posted below. To start with the creating Elastic Beanstalk , we need to set a name for Application that we intend to deploy. This option is used where the operations take a long time to complete such as tasks for image/video processing, generating zipped archive, etc. The worker tier do not directly respond http request. Instead it offloads long-running processes from your web tier using SQS. Here we use Webserver environment to demonstrate web application such as wordpress. In this case we are trying to upload a wordpress application . Deployment policy: This option controls how the deployment is performed in the instances launched using auto scaling groups. This comes handy when we update our application in batches so as to avoid downtime when deploying. These are the options available in the deployment policy. Environment URL: A url will be generated in this field which is used for the accessing the application . You can test the availability of the url generated using the “check availability” button. If you want to deploy the database of the application is RDS, select both the options as listed above. Instance type: select the instance type you wish to create. EC2 key pair: select the key pair you wish to set for the instances launched. Custom tags can be created to identify the instances launced. Check the AWS doc for more details on the RDS Configuration options. Select the appropriate instance profile and the service role. 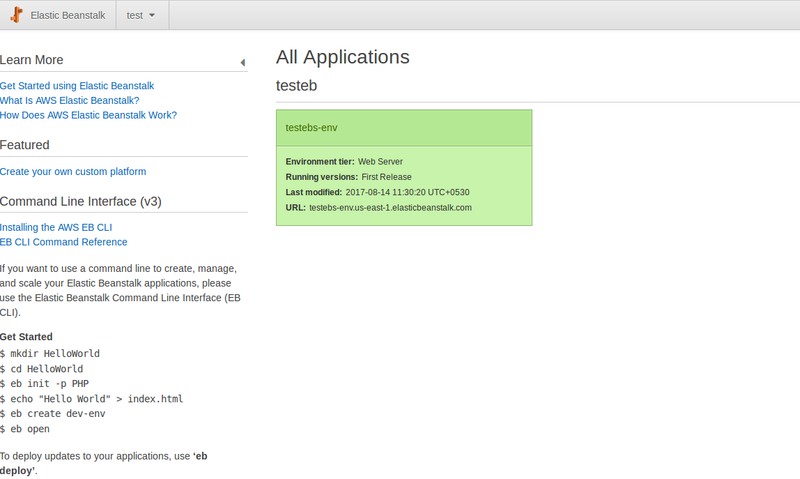 Check the information from the final page and select “Launch” button to launch the application using Elasticbeanstalk. Once you have the application deployed , you will see following page in the Elastic Beanstalk Dashboard. 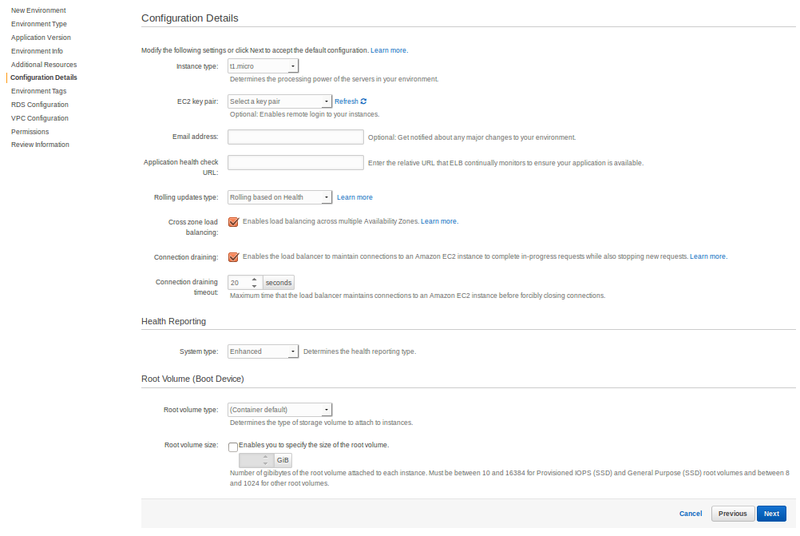 The configuration page shows the current configuration of your environment and its resources, including EC2 instances, ELB, notifications and health monitoring settings. Use the settings on this page to customize the behaviour of your environment during deployments, enable additional features, and modify the instance type and other settings that you chose during environment creation. This will include tweaking autoscaling policies, Monitoring interval , environment type, auto-scaling policies like min/max instance count, availabilility zones, Scaling cooldown time , Scaling trigger & time based scaling, Deployment & Update policy . It also allows you to set set maintenance window for carrying out updates in a predefined time. 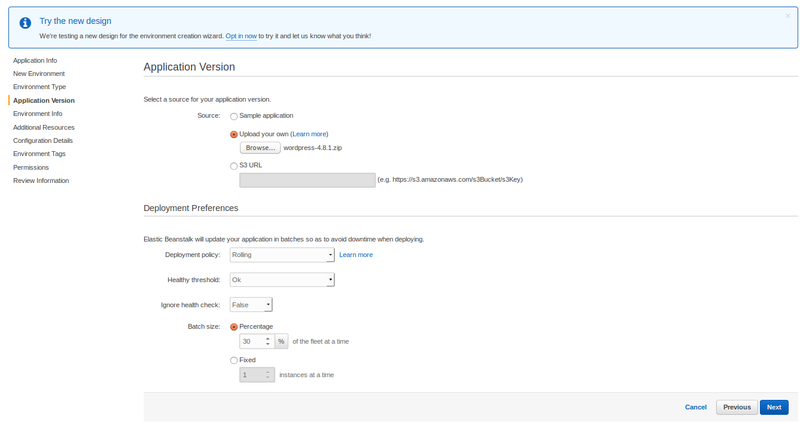 Load the URL generated from the elastic beanstalk dashboard to load the application deployed. This page displays the wordpress web application we have uploaded from the Elastic Beanstalk. The above installation wizard has to be continued to install wordpress. We used wordpress installation to show how a php application can be deployed using HA options using Elastic Beanstalk. We can extend the same tutorials to deploy a variety of applications listed in the following links.